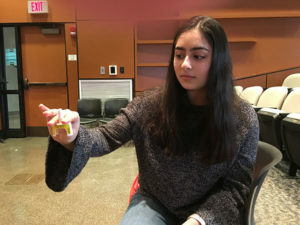 Shrewsbury/Westborough – Shrewsbury High School senior Amber Ali is a busy girl. As she eagerly awaits those all-important college acceptances, she is working diligently on her Girl Scout Gold Award project. Her project is based on the opioid crisis and the use of Narcan which can reverse an opioid over-dose. The topic is timely as opioid addition has reached epidemic proportions across the nation and does not discriminate. “My goal is for more community members to have Narcan in their own homes because you don’t know who is affected by the opioid epidemic,” she added. Ali is a student liaison to the Shrewsbury Youth and Family Services (SYFS) Board of Directors. As such, she has learned, first-hand, of the opioid issues facing Shrewsbury. This exposure greatly influenced her decision to pursue this topic for her Gold Award project. “Half of the overdoses are occurring in homes so we want everyone armed and ready to respond. Expanding opioid and naloxone awareness is an important element in the public health response to the opioid epidemic. By choosing to tackle this important and difficult community issue, Amber has demonstrated that she is clearly a role model and a distinguished leader. It was my distinct pleasure to support her efforts to pursue the Girl Scout Gold Award,” remarked SYFS Executive Director Christine Mowry, who is serving as Ali’s advisor. Her public awareness campaign aims to teach how to recognize an opioid overdose, when to use Narcan, how to administer it and where to obtain it. She planned two public presentations. 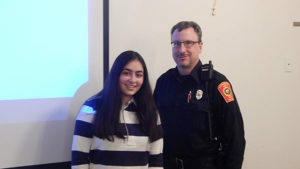 The first was held March 3 at the Westborough Public Library and another is scheduled for Saturday, March 16, at 3:30 p.m. at the Shrewsbury Public Library, 609 Main St.
“Amber is doing fantastic … she is self-motivated and she has done a great presentation and is getting out in the community. She is sharing what she has done which is the whole point of the project,” remarked Stacy Obey, Ali’s Gold Award mentor through the Girl Scouts of Western and Central Massachusetts Council. A website is in the works and she is working on developing a program with the Chamber of Commerce to help businesses be able to identify the problem and be equipped to use Narcan. When not studying or attending to Girl Scout activities and SYFS commitments, she plays tennis and is a member of the Shrewsbury High School tennis team. She hopes to major in a biological science discipline in college and possibly pursue a career in the healthcare field. Amber Ali demonstrates how to use Narcan.